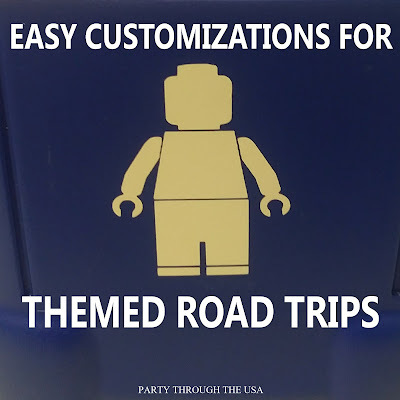 We're still getting ready for our "Everything is Awesome" Lego road trip. We've been planning for months, but we're finally getting close to leaving. As I put together the final touches of the trip, I wanted to share with you all some easy, fun ways to customize your accessories for a themed trip. 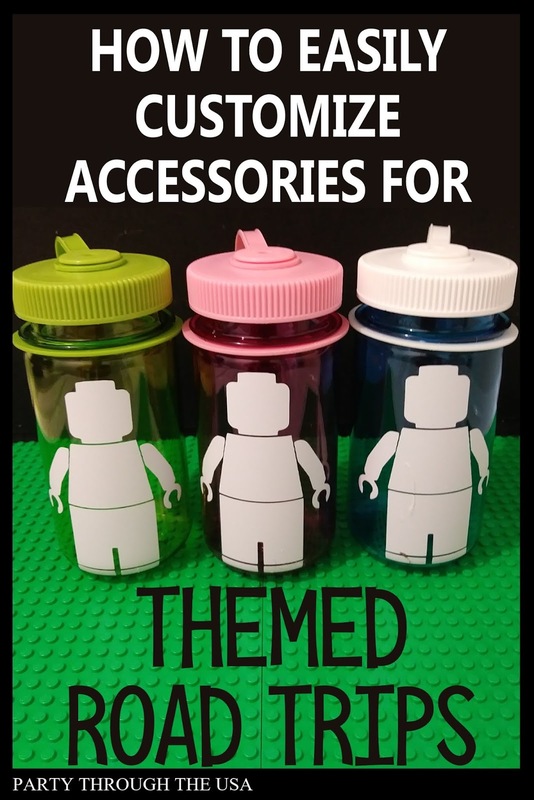 Of course, I'll be showing you a few Lego things, but these ideas will work for any theme. After spending way too much time researching water bottles, testing out a few, and debating all the options (and I'll do a blog post in the future), I finally decided to use plain Nalgene mini bottles. 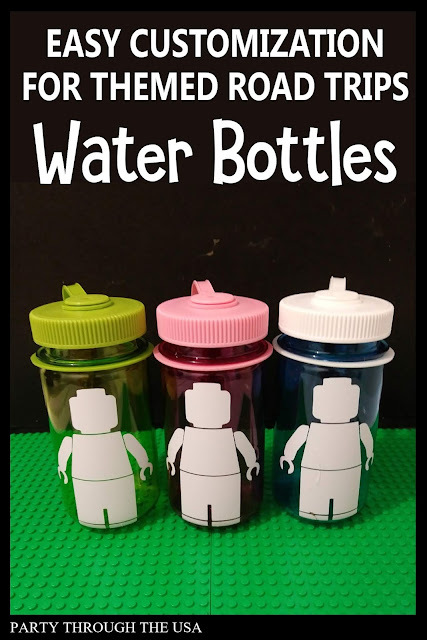 I usually fill the bottles with a lot of ice cubes and a bit of water for our trip to help with the potty stops, and I like that this water bottle has a large lid for filling. 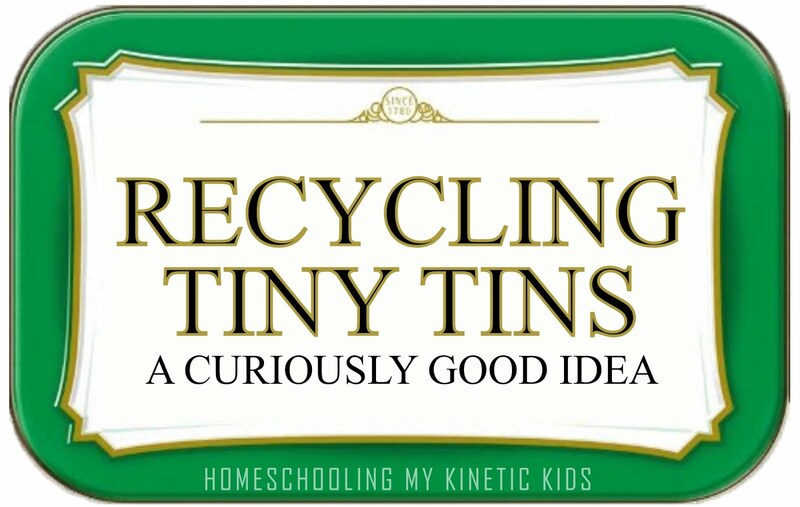 The simple lid design should be easy to clean and unbreakable. I also really like that these water bottles are a plain color, because it makes them perfect for vinyl stickers! I bought mine from Etsy, since I don't have my own cutter. These bottles are 12 oz and the stickers are 5" tall. They were very easy to put on, and I love the way they look. I even added one to my husband's Contigo Autoseal, leak-proof, insulated coffee mug. It's awesome! I saw an idea on Pinterest to use these yellow cornstarch containers for storage. I originally was planning on using this bin for a car pulley system for moving snacks from the front of the car to the back, but I changed by mind. When I put the vinyl stickers on this bin, I decided I needed more of them and would use them for snack storage (or any sort of storage) on the road trip. 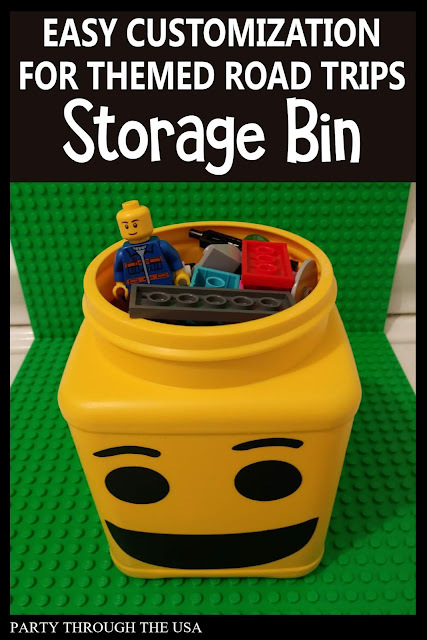 As you can see, it's also a nice little box for Lego bricks. Most of the time when we go on a road trip, we pack way too much food! I pack like I'm heading for the Kalahari and will die if we break down without food and water. Although we have done that sort of trip in the past, we're not doing anything like this this time. 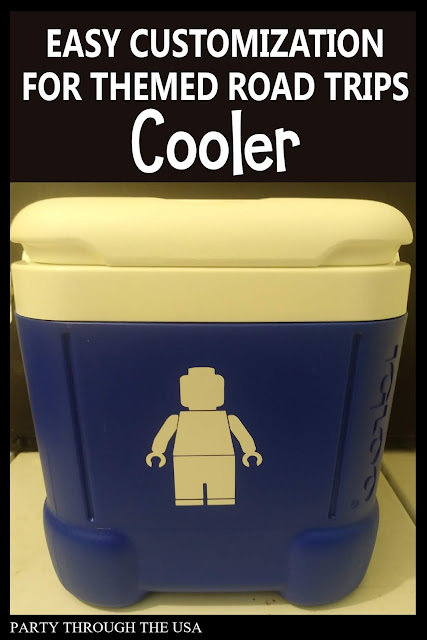 I bought this small cooler for a few cold drinks and ice. Since I already had a bunch of vinyl stickers, I decided to add one to the cooler too. It stuck pretty well, but feels like it'll peel off without much encouragement. Customization is great, but being able to change out the sticker for the next trip is even better! When we decided to do a Lego road trip, I was very excited to find Lego man candy molds. 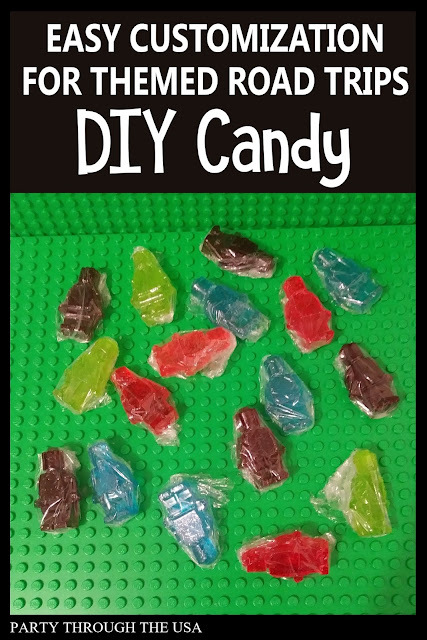 I don't know if this candy "recipe" could be any simpler. We put one Jolly Rancher in each man and stuck the whole thing in the oven (300 degree F) for about five minutes. After they melted completely, we took them out of the oven and allowed them to cool before taking them out of the mold. I wish the picture was better, because they're absolutely adorable! 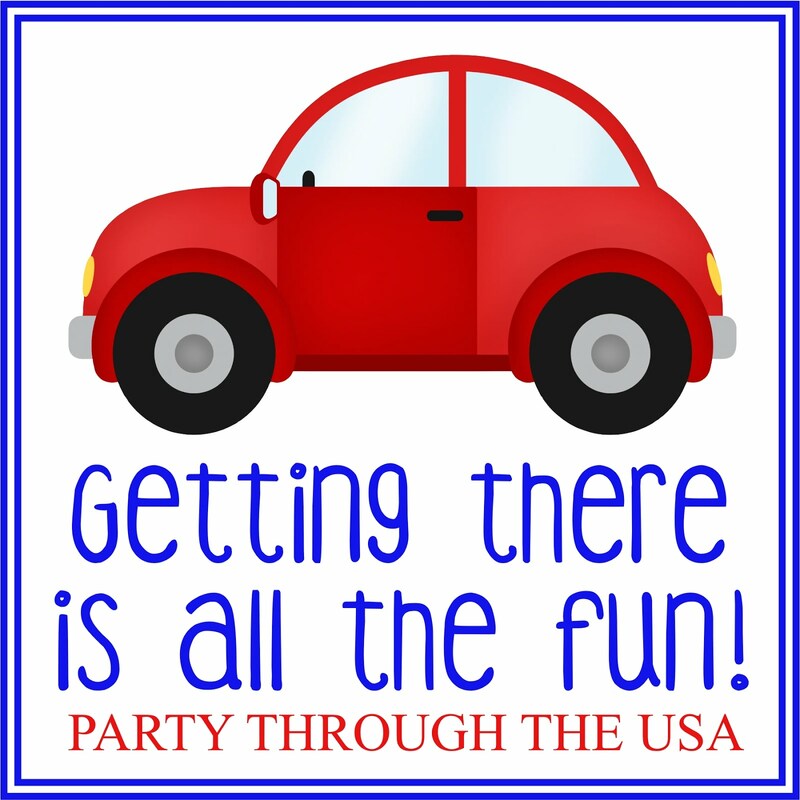 For more ideas about themed road trips, click the link. 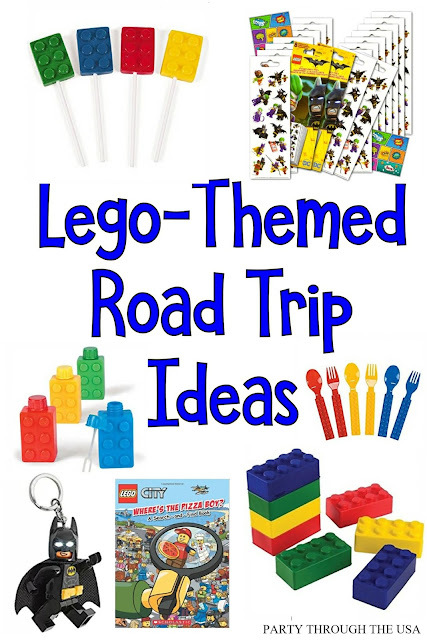 Click the picture below to see more Lego Road Trip Ideas.